Harri Furu (left) from Rani Plast personally presented Glenn Sundqvist (right) with the grand prize. Sundqvist’s son Jimmy, who often helps with baling, can be seen in the middle of the picture. 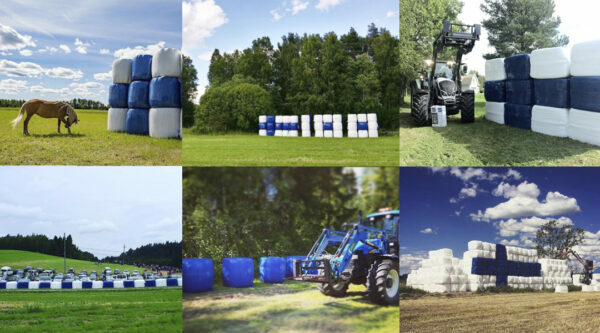 In the summer, Rani Plast announced a photo contest to highlight the blue and white silage bale wraps created to celebrate Finland’s 100th anniversary. The winner has now been selected. When Glenn Sundqvist read about Rani Plast’s Instagram contest in the spring, he immediately decided to participate. He works as a farmer and had his own supply of the blue and white bale wrap stretch film, so finding suitable subjects to photograph proved no problem. 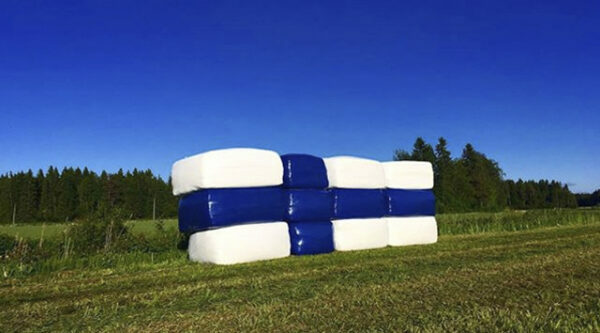 “I arranged bales into the shape of the Finnish flag on my field next to Highway E8 in Lepplax, Ostrobothnia. Me and my wife joked that we would win the contest, but when I saw all the nice pictures from those taking part in the contest I did not feel very confident of my chances,” says Sundqvist. The contest’s grand prize was a K-Group gift card to the value of €500. Sundqvist has not yet decided how he will spend the prize money. In addition to growing organic grain, Sundqvist also breeds cattle. The contents of the photographed bales are for feeding his own cattle, but he also makes some bales for others. “I have long been using Rani Plast stretch films and I am very satisfied with their quality,” he says. Rani Plast’s Instagram contest was a great success and there were more than 270 entries. “There were many great shots among the photos and choosing a winner was no easy task,” says Harri Furu, Area Sales Manager at Rani Plast. In the end, the panel decided upon Glenn Sundqvist’s photo, since the silage bales seen were cleanly made and the composition and lighting were great. The picture was taken on Midsummer Eve, which explains the atmospheric lighting. Rani Plast is the largest agricultural film manufacturer in Finland. The idea for making blue and white stretch films was born last year, since the company wanted to take part in celebrating the centenary of Finland’s independence. One euro for each bale roll sold during the campaign was donated to the Mannerheim League for Child Welfare. Over 270 entries participated in the contest.